Perhaps it was boredom. Perhaps it was curiosity. Perhaps it was my desire taking over me to do something “edgy.” Who the hell knows. 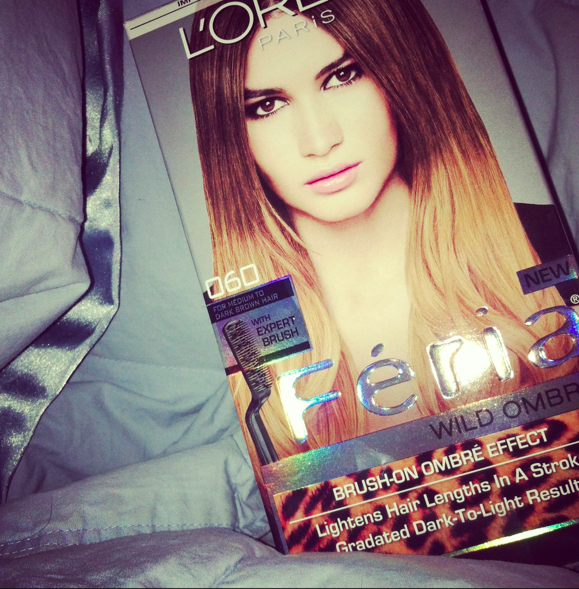 But L’Oreal’s Ombre in a box called to me … and yes friends, I answered. Now I didn’t just go into Target, spot the product and say, “oh yeah … let’s fiddle with some bleach on my very processed, overly straightened hair.” No, absolutely not. Mama did her research. I watched the YouTube video reviews … which, gotta say … I kind of regret. 1. The girls are 85% super annoying, all focused on being Rachel Zoe and looking super maj in front of the camera and not focused on the important things like, oh I don’t know … how to use it perhaps (not all … but most). 2. They all put these fears in my head, like, “OMG her hair turned bleach blonde after 45 minutes, must not leave it on that long. Lesson Number 1 that I learned: Everyone has different hair. Just because the girl reviewing has long dark brown hair like you, doesn’t mean she is you. This was the best video I watched, which of course came straight from the L’Oreal source, because they show you how to apply the product properly. God knows if that is even a real hair stylist. They could have found a hobo on the street, glammed him up and gave him a French accent for all I know. Regardless, very informative, and very necessary before you apply. So then it was time to take the plunge. 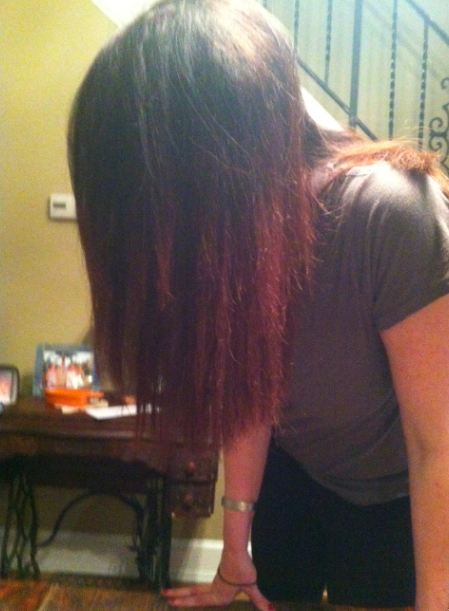 There is something really exciting, fun and terrifying about dying your hair a new color that I love. 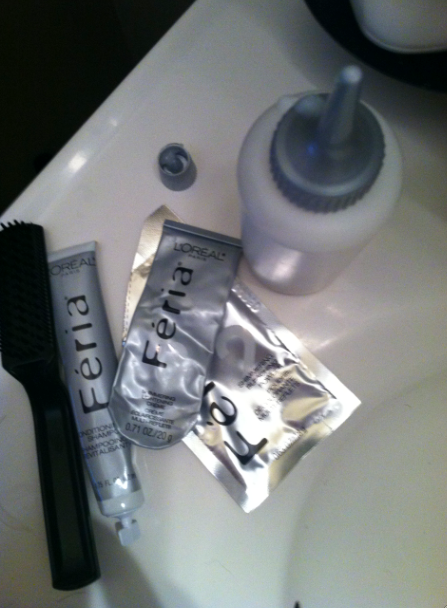 Once the color was mixed, I dropped my first layer of hair down and applied the dye to the nifty little application brush (the black thing seen in the photo to the right), which rocks at first. But word to the wise, you HAVE to make sure you hair isn’t the slightest bit tangled, otherwise it will get ripped out, you’re been warned. The reason I wasn’t really down with the application brush is because I found you had to put a lot of dye on the brush, and by the time I got to my ends, I really had to brush hard to get all of the dye on your hair. The brush is deep so all the dye goes straight to the bottom, making it a bit tricky to get it all out. But Lesson Number 2 that I learned: Slow the eff down. I’m always in a mad rush to the next thing. And while dying my hair, it is like someone is threatening me with a knife telling me to get it done as fast as possible or I will get cut. I have this sick fear that if I don’t rush, some hair will be all sorts of different colors and I will have to spend the rest of the day in the fetal position crying, “WHY??!? !” (probably why I should leave it to the professionals, huh). I bet you are just DYING to know the results, right? Like so curious? 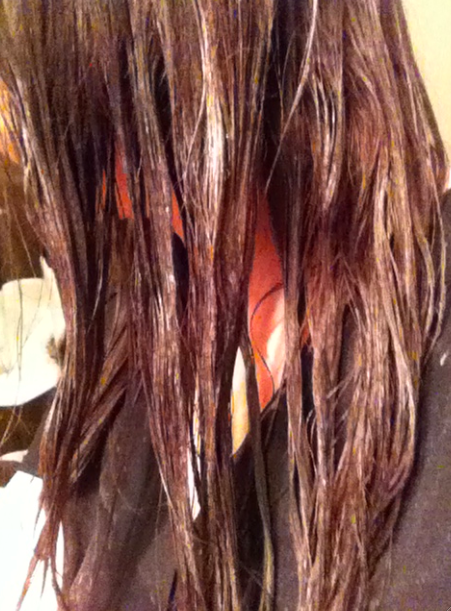 Well … Lesson Number 3 that I learned: I will never be blonde. I think my hair repels it, to tell you the truth. I don’t have a drop of blonde on my head right now, but instead I have this like reddish, lighter brown ombre thing happening, which I don’t hate, but the part that kills me … no one has even noticed, hmph. I just wanted to be “edgy” DAMMIT! The experience was definitely, “MEH.” And man did it do a number to the ends of my hair. Even using the conditioning shampoo that it comes with, I have this scarecrow hair from the Wizard of Oz thing going on that I’m not too fond of. But that’s what you get for using any sort of bleach-product I suppose. Any who am I regretting this decision immediately? No. Am I bummed that I got less than mediocre results? Hell yes. Would I recommend? Of course, refer back to Lesson Number 1. Listen, I would rather do an experiment for $8 than have a stylist do it for $100, ya dig? Now excuse me while I go make an appointment with my colorist so she can get me back to normal espresso brown … a thank you very much. Ps. What is up with the chick’s hair on the ombre box? Seriously … they couldn’t find a better model with ombre hair? Because that ain’t cute, L’Oreal … no one in their right mind wants to look like that. ← Wear Green Responsibly … Or Get Pinched! If you still want Ombre, go to a good stylist. They can do it with hair paint (balayange). Trust me. It’s expensive but it looks great and lasts for almost a year. This has been your Farber Beauty tip for the day. So happy you posted this 🙂 Thanks for doing a realistic review! Depending on the color, toners or sometimes even just a purple shampoo/conditioner (all from beauty supply stores like Sally’s) will help with brassy or reddish hues. Also, a simple homemade mask of one mashed up avocado, a bit of olive oil, and an egg can do WONDERS for frazzled ends if left on 20-30 minutes and shampooed/conditioned out as normal. I love this tip … definitely going to give it a try! My dead ends thank you endlessly!